When I was a child, it was a given that on the weekends, especially during the summer when we didn't have games or swim meets or other activities taking up our cleaning time, that we had to perform a certain amount of chores. Chores weren't necessarily done to earn allowances, but more to earn the rights to have things bought for us... fees to participate on sports teams, new uniforms or swim suits or goggles, new basketball shoes or shorts, special meals out, etc etc. In my opinion, a super fair way to 1) get the house clean and 2) teach us that doing things we want to do is a privilege not a right. I will climb off my high horse now... just saying I had good parents. In order to keep things as "even" as possible, Mom would have us write out all the chores on little slips of paper, stick them in a bowl, and draw chores. Inevitably, one of us got stuck with one or two more of the "just-shoot-me-now" chores, but eventually, after a full summer of chores, it evened out. Of course, in the moment we couldn't see the future and how it was possibly fair that one of us got ALL of the horrible jobs, and a fight would ensue... but I look back on it now with rose colored glasses. I am sure we all of have "just-shoot-me-now" chores. For me, as an adult, its putting away my laundry (not folding, just putting it away... I don't know why so don't ask) and unloading the dishwasher... it's just too much back and forth for my taste and the way a hot, freshly cleaned plate feels gives me the heebie-jeebies (like cotton balls between your fingers, ya know!?). As a kid, and I think my sisters might agree with me here, it was vacuuming the stairs and scrubbing the bath tube. I know what you are thinking, those are NOT THAT bad. But they were. First of all, we had one of those central vacuum cleaner units. This means as a small child (I am a small adult, too, so do the math), I had to drag a giant hose to the top of the stairs to plug it in to the wall. I then had to go stair by stair hoping the heavy hose wouldn't snake down the stairs too quickly and launch me down the rest in an avalanche of limbs and vacuum. Oh! And god forbid the plug was in a convenient place so that the hose made it all the way down the stairs in one go! Nope! Had to run back up when I couldn't go any further, then carry that fireman's hose back down the stairs to start again from where I left off. Now that I think about it, I should have been a firefighter. I had been training for it all my life. As for the bathtub cleaning, we took a lot of baths. And the master bath was a jacuzzi so we obviously all used the same tub even though we had one in each of the other bathrooms. AND there was no way we were taking baths without bubbles, or epsom salts, or shaving our legs. Let's just say it was annoying to scrub. Again, small human, deep tub, stubborn soap scum. There really is no reason for this story, I just thought I would share because the clothes dryer and the dishwasher are both full and clean at home right now and I. JUST. CAN. NOT. 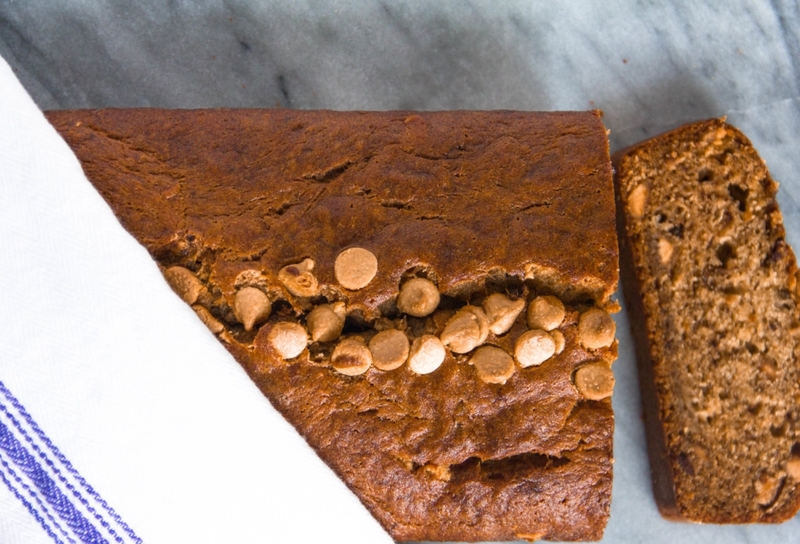 The light at the end of the chore tunnel this week though is this peanut butter banana bread. It is delicious. I use four very ripe bananas, a combo of both brown and white sugar, and a hearty helping of peanut butter chips to give this bread loaf just the right amount of sweet edge to make you forget that all those clothes are folded on the bed upstairs dying to be put into the closet and drawers.